The Internet is hungry for more information about Discovery's "Eaten Alive." You would think that having a blindfolded Nik Wallenda walk on a tightrope would be enough to feed the Internet's appetite. Yet, the Discovery Channel's latest must watch program "Eaten Alive" shows otherwise. According to Discovery's website, "Eaten Alive" will include wildlife filmmaker Paul Rosolie donning a protective suit which will allow him to be swallowed up alive by an anaconda. Yes, he's choosing to get eaten by a giant snake. While some on the Internet have balked at the stunt wondering how it could ever be real, Discovery's website has the show scheduled for December 7th. 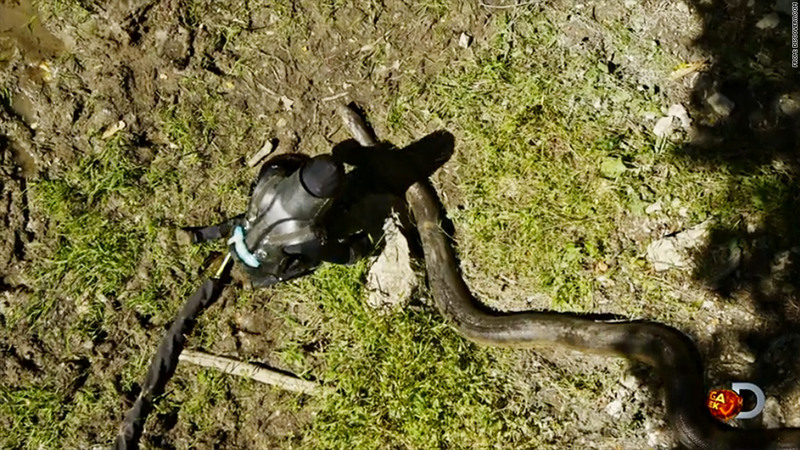 Unlike other big events on Discovery, "Eaten Alive" was taped rather than live. This, plus the fact that Rosolie is tweeting proves that he got out alive. "If u know me - I would never hurt a living thing," Rosolie tweeted. "But you'll have to watch #EatenAlive to find out how it goes down!" Disbelief over the stunt has also not stopped those in media from writing about it (present company included). By the publication of this story, typing the term "Discovery Channel Eaten Alive" into Google News brought up more than 200 articles on the subject. "Eaten Alive" is another in Discovery's attempt to create big TV events to grab an audience who can't miss watching something as it happens. This was shown last Sunday with the Wallenda tightrope walk between skyscrapers. Promos for "Eaten Alive" actually began during the special. Ratings for Wallenda's tightrope stunt were a bit lower than his first tightrope walk over a gorge in the Grand Canyon. Still, it brought in a lot of publicity for the channel. Something that "Eaten Alive" has done far before it even slithers onto the airwaves.